Yesterday, November 17, 2015, the Seattle City Council Budget Committee voted 8-0 to add $2.265 million to the City’s budget as a one-time allocation to address the crisis of homelessness. These funds will be intended to provide new and expanded shelter beds, extended day center services, maintenance of skilled outreach services to vulnerable homeless adults, support of authorized encampments, and child care for homeless children. The Green Sheet (Council’s process of changing the Mayor’s proposed budget) can be viewed here, specifies that the $2.265 million will come from the City’s General Subfund, and outlines the process for spending the money. The Coalition’s list of recommendations for new shelter, extended hours & increased capacity, and crucial services was included as an attachment to the Green Sheet. The final budget vote is next Monday (11/23). We will now work closely with the City to ensure that these funds are put into action as soon as possible to bring people inside quickly. Your Advocacy made a HUGE difference! Thanks to EVERYONE for calling, mailing postcards, e-mailing, signing our petition (400+ signatures! ), and showing up at multiple City Council meetings to share your powerful examples of why we must ‪#‎BringPeopleInsideNOW‬. Please join us in THANKING all City Councilmembers via e-mail, with SPECIAL THANKS to Nick Licata for shepherding this proposal through the budget process. Stay tuned for more opportunities to take action! If you haven’t already, please sign up for the Coalition’s Action Alerts and follow us on Facebook and Twitter (@Homeless2Housed). Check out media coverage of the Coalition’s organizing on our website and Facebook. The Coalition on Homelessness needs YOUR help to make sure that everyone in our community knows how to vote in the November 3, 2015 General Election. 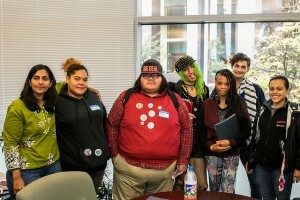 This year the Coalition and Member Organizations, thanks to great staff and volunteers, helped 188 homeless and unstably housed people register to vote, and we want to make sure that each of them, and anyone else you work with, know how, when, and where to turn in ballots, as well as what to do if they haven’t received their ballot. Please share this information and call King County Elections (206) 296-VOTE (8683) if you have any voting related questions. Another opportunity to TAKE ACTION: Join Coalition members on Tuesday, October 20 at the Seattle City Council Budget Hearing (Seattle City Hall: 600 4th Ave, Seattle, 98104) to tell your elected officials why it is necessary to fully fund Human Services. 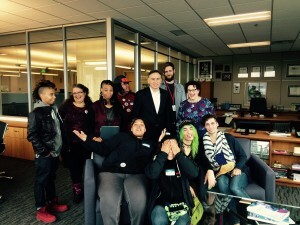 Check out this Action Alert from the Seattle Human Services Coalition for more information. We need your help to fill the room in support of human services. Tuesday, October 20 Ballots are mailed to registered voters 20 days prior to the election. If you have not received your ballot by Tuesday, October 20, call King County Elections (206) 296-8683. SPREAD THE WORD – put up a sign in your building to alert folks to call King County Elections if they haven’t received their ballot, and to let them know where to drop off ballots near your location. Monday, Oct 26 In-person voter registration deadline for people not currently registered in WA State. Your new registration must be received in-person at either the Renton office: 919 SW Grady Way, Renton, WA 98057-2906, or Seattle office: 500 4th Avenue, Room 440, Seattle, WA 98104. Tuesday, Nov 3 Election Day! Ballots must be dropped at ballot drop box (by 8pm) or postmarked by Nov 3, 2015. Ballots can either be mailed in (with first-class stamp, postmarked by Tuesday, November 3), or dropped off at a Ballot Drop Box (24 hours/day – see below) or Ballot Drop-Off Van (daytime hours 10/31, 11/2-11/3 – see below). You can also download a word document of this information. You Don’t Need a House to Vote: Spread the word to help people register by July 6 for the 8/4 primary election. We may not be voting on the president, but this is still an important election! Here’s why: Half of the King County Council and all nine of the Seattle City Council are up for reelection, it’s a big year! Voting is important and helps ensure that people’s voices are being heard. Encourage our whole community to take part! Help ensure that every eligible voter is registered and votes in this August’s primary election. Mailing address: voters MUST provide a mailing address because ballot will be mailed to voter. See our guide for places to receive mail in the county, such as Compass Housing Alliance (77 S. Washington St, Seattle, 98104). If you work at a place where clients can receive mail, they can use that address as a mailing address. If you did not get a ballot in the mail in April for the special election, your registration may have lapsed. Because all voting is by mail, the state doesn’t want to pay postage if they aren’t sure if someone is still at the same address, so if a ballot is not returned for 2 years, they deactivate your registration. If a person has access to the internet they can check their voting status here. Fill out a new registration form, or complete a registration online. It never hurts to send in a form even if someone isn’t sure if they need to or not, but it wouldn’t be fun to not receive a ballot during the election. The Coalition on Homelessness will offer a formal voter registration training in the fall before the registration deadline for the November General Election. If you are interested in more information please contact Hillary. Remember, voting is a form of making one’s voice heard: people experiencing homelessness in our region need to be heard. Let’s work together to make sure all eligible community members are registered to vote. 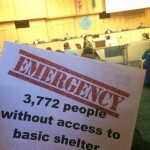 The following comments, written by Alison Eisinger, Director of the Coalition on Homelessness, were shared at the Seattle City Council Meeting on Monday, March 30, 2015 in support of CB 118310, an Ordinance to permit transitional tent camps for homeless individuals as an interim use on City-owned or private property. Hillary Coleman, Social Justice Intern at the Coalition, read Alison’s remarks as Alison was out of town at a conference. We are glad to say that the ordinance passed unanimously! We also supported an amendment by Councilmember Sawant to review permitting camps in residential zones which passed as well! Thank you City Council, let’s keep working together to provide more shelter and housing options for our community. View testimony from many Coalition friends here. Hillary reads Alison’s remarks at 45:40. Thank you for taking up Mayor Murray’s version of CM Licata’s original proposal to create more opportunities for organized tent camps in Seattle. The Coalition strongly supports passage of this proposed legislation. We also support the amendments that would address the fact that homelessness is not confined to specific neighborhoods, cities, or communities, and the solutions to homelessness — both interim and permanent — must not be restricted geographically either. People who are without basic shelter in our community are currently living in all kinds of neighborhoods. When 1100 volunteers counted 3.772 people outside during this year’s One Night Count, they counted people in Queen Anne, Ballard, SoDo, Lake City Way, Georgetown, and Ravenna. They also counted people in Renton, in Kent, Kirkland, ,Kenmore, Vashon Island, Bellevue, Redmond, and Des Moines. In considering making additional city-owned property available for organized tent camps, the council should not seek to limit which neighborhoods they can occur in. Our city policy should reflect our values: people who are homeless should be living in residential neighborhoods- that is the point, isn’t it, to include and recognize people rather than literally marginalize them and make their lives more difficult. Excluding residential neighborhoods in Seattle from consideration is an awkward and arbitrary attempt that is not supported by the evidence of more than ten years, and the personal experiences of thousands of people, both housed and homeless. And, consider this: doing so sets a bad precedent. Seattle electeds say they want to see more, not more restrictive, demonstration of willingness to respond constructively to homelessness in municipalities across our region. What will you say to elected officials in Issaquah or Snoqualmie or Burien or Shoreline who agree to host tent cities or site shelters or services in theory, but who say that they just cannot identify suitable property that is not in a residential neighborhood? Finally, we applaud this significant step in the right direction, even as we urge the Council and the Mayor to make good on the Mayor’s commitment following the Unsheltered Task Force to add 150 year-round shelter beds, providing indoor safety and stability. And, as we all turn attention towards renewal of the Seattle Housing Levy, let’s remember that our city has a robust responsibility to fund housing for people who are homeless.